This Low-Carb Slow-Cooker Pumpkin Custard is like pumpkin pie without the crust. It makes a delicious dessert that can work for low-carb, keto, lc/hf, diabetic, gluten-free, grain-free, Paleo, or Banting diets. Okay, so I admit it, I’ve been a bit obsessed with pumpkin lately. I hope all of you are as obsessed about it as I am! If not, don’t worry, I promise that I’m moving on to new things and new flavors. 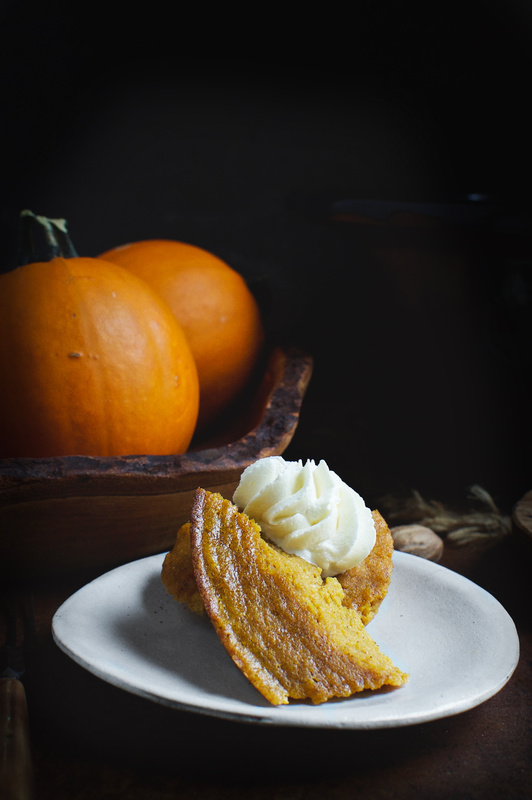 I won’t promise that this is the last pumpkin recipe, because I know that as soon as I do that, I’ll jinx myself and will only be able to think of recipes for pumpkin. Maybe I’m superstitious, but I just can’t make that promise. 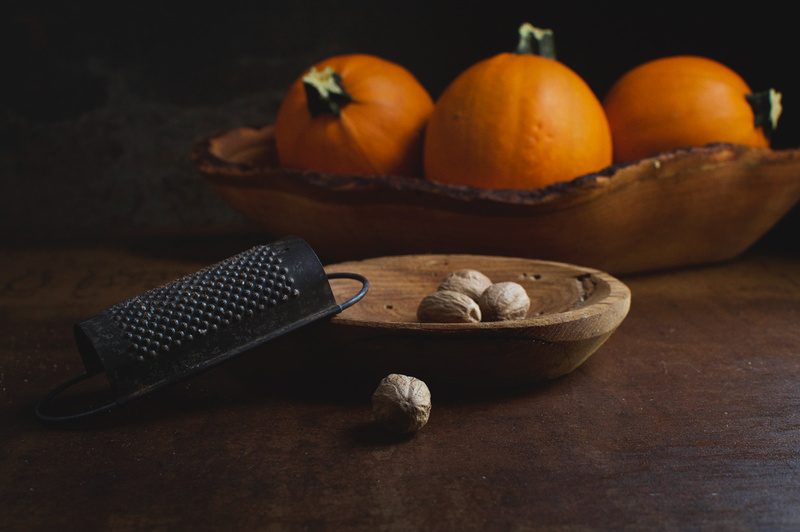 This recipe is a new take on an old favorite–pumpkin pie. It’s unique because it’s baked in a slow-cooker. This cooking method isn’t the only thing that sets our recipe apart, however. 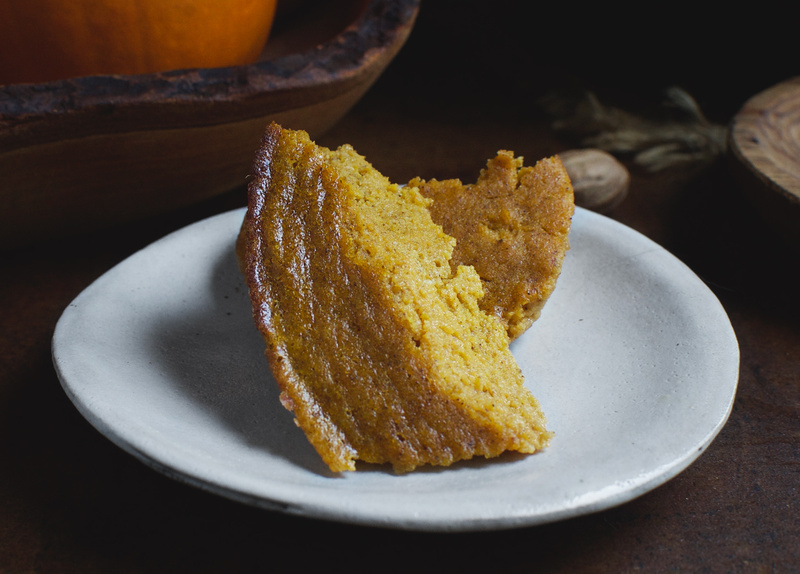 This pumpkin custard doesn’t have a crust like it’s traditional cousin. Yep, it’s just the good, creamy custard. The thing I love about this custard is that there’s no crust to deal with. This makes it super-easy to whip up. Sometimes I just don’t feel like futzing with a pie crust. I also love that I don’t need to heat up the oven just for one little dessert. Just pop all of the ingredients in the slow-cooker and let it go to work. The slow-cooker doesn’t heat up the kitchen on those warmer days, and also leaves the oven available to prepare dinner. This custard is easy to turn into a Paleo-friendly dessert. All you need to do, if you don’t use butter, is substitute in coconut oil. For the sweetener, I use a stevia/erythritol blend, but if this doesn’t work for you, you can use another granulated sweetener. Just keep in mind that the sweetener I use is twice as sweet as sugar, so you may need to adjust the quantity to get the same level of sweetness. I have made this recipe using both vanilla and maple extracts/flavorings. They are both delicious, just different. The vanilla is a more traditional choice, but the maple flavor adds a warmth to the recipe unlike anything else. I used a 4 quart slow-cooker for this recipe. It’s the smallest one I have. You could probably make the recipe in one that is slightly smaller (cooking time may go up), but I would not use a larger one without doubling the recipe. The one I used is pretty bare bones and doesn’t have some of the bells and whistles some of the other slow-cookers have, but it was inexpensive and does a fine job. It just doesn’t turn off automatically when the food is done. 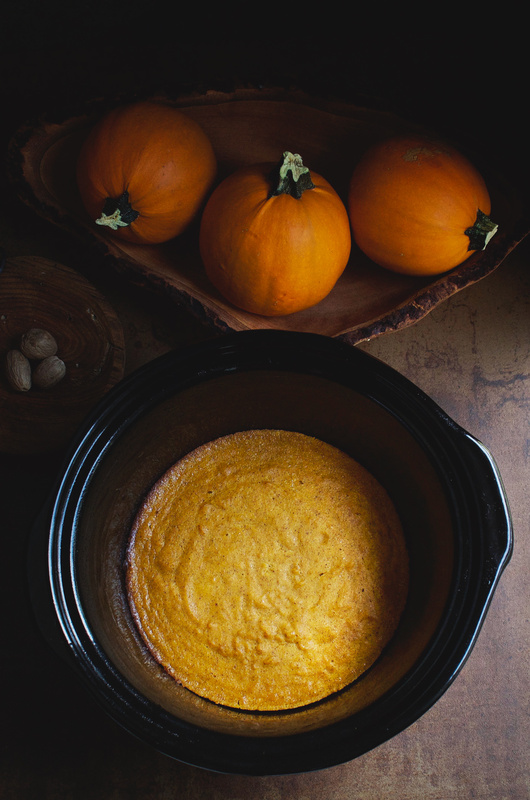 I love to serve this Low-Carb Slow-Cooker Pumpkin Custard while it’s still warm. I spoon it out onto plates, then top with a bit of stevia sweetened whipped cream and sprinkle with a bit of nutmeg. If there are any leftovers, I generally eat them for breakfast the next day. I can’t help it that I love eating dessert for breakfast. Enjoy! Spray or grease the inside of a 3 or 4 quart slow-cooker crock using coconut oil spray or butter. Break eggs into a medium mixing bowl. Blend until smooth and slightly thickened, using a mixer. Gradually beat in sweetener. Add pumpkin puree and vanilla (or maple) extract to the egg mixture and blend in. Blend in almond flour, salt and pumpkin pie spice. Continue to blend while , streaming in the melted butter, ghee, or coconut oil. When all ingredients are well mixed, transfer mixture to the slow-cooker. Place a paper towel over the crock, then cover with the lid. The paper towel between the top of the crock and the lid absorbs the condensed moisture that forms on the lid and keeps it from dripping onto the custard. Set slow-cooker to the low setting. Cook for 2-2:45 hours, and begin checking at the two hour mark. when custard is done, the sides will pull away from the crock and the center will be set. For me, it's usually done in about 2 hours and 15 minutes. Serve warm with stevia sweetened whipped cream and a sprinkle of nutmeg, if desired. any ideas on how best to make this without eggs? This recipe is fairly dependent on the eggs. I’m not sure how it would work with some sort of egg replacer. My recipe for Low-Carb Pumpkin Ice Cream would work fine without eggs. I would just add about 1/4 more whipping cream. You may also want to switch about a half cup of the milk added at the end for heavy whipping cream. This will help maintain the creaminess of the ice-cream. Good luck! 1/2 cup of stevia is a lot! That stuff is not cheap where I am – any thoughts on subs or using less? It’s actually not 1/2 cup of pure stevia, but rather a stevia/erythritol blend. I use the brand name Pyure, which is available online through the Amazon link for the recipe ingredient. My local Walmart usually carries it as well. Be sure to get the one that is twice as sweet as sugar, It will give a conversion of 1/2 cup Pyure= 1 cup stevia. Let me know if you have any other questions! Could you substitute Splenda for the Stevia and Coconut flour for the Almond flour? Splenda should not be a problem. If you use the one that measures like sugar, you’ll need to double the amount to get the correct level of sweetness. The sweetener I use, Pyure, is twice as sweet as sugar. Coconut flour should work as well, but you will need much less as it absorbs a lot of liquid. I would start at a tablespoon or two. I haven’t tried either of these substitutions, but I don’t think they will be a problem. Let us know how it works! No not the coconut flour. Coconut flour is very obsorbant and needs to be balance with xtra fluids. Maybe you can find a conversion chart? When I added this recipe to My Fitness Pal it says there’s 33 g of carbs. Why is yours so low?? The difference is that My Fitness Pal counts sugar alcohols as carbs. I do not count them, especial erythritol as it goes through the body unchanged and is not metabolized. Also, I’ve noticed that some of the values on My Fitness Pal can be wildly incorrect. I always look through the values and make sure they make sense first. Can honey be substituted for erythritol? I’ve not read good things about it. Honey or maple syrup should work fine in this recipe. Either will change the flavor a bit. Both will also increase the carb count significantly. Good luck! If using maple syrup, is 1/2 cup the recommended amount? Will more almond flour be necessary? Hi Sharon, I don’t work with maple syrup very often, so I can’t give you a definitive answer on this. It will make the batter more liquid, and there isn’t any wet ingredients I would want to take out, so I would try to use as little as I could. I might start with 1/4 cup and if that doesn’t dramatically change the texture of the batter, add a bit more. I can’t possibly try all of the recipes with every substitution, and I can’t make a real recommendation without trying it first. Sorry I can’t be more specific! If you try it, let us know how it goes! Thanks for the great idea using the slow-cooker! After trying the recipe with pumpkin I’m going to try it again with sweet potatoes. Maybe it will be similar to sweet potato pie! Yum! I don’t use any fake sugars, so I’ll use real maple syrup. I think it will be delicious with maple syrup and sweet potatoes! Most of my followers can’t eat these as they are too high in carbs. Let us know how it turns out! I agree that maple sugar affects the blood sugar dramatically. This is why I personally prefer low-carb sweeteners. Some people who follow my blog eat a Paleo diet or some other diet instead of low-carb, so I try to be mindful of that and give options. You could always use maple extract, if you want the flavor and no added sugar. What is the serving size? Not sure if I missed it in the recipe? knowing that makes it easier to figure out if we should double recipe…Sounds Delicious!!! Serving size is 1/6th o the recipe, so if you divide the custard into six equal pieces, each one is a serving. If you double the recipe, there will be 12 servings, so the serving size is 1/12th of the recipe. I think that’s a brilliant idea! That would allow it to cook all the way through without the edges burning. The cooking time may vary. Let us know how this works for you! Is crockpot cooking time the same if you double recipe? If you’re using a large slow-cooker (6 quart or so), the cooking time should be similar or a little longer. I would start checking it at about the 2 hour and 15 minute mark. If you’re using a medium slow-cooker (4 quart or so), it will probably take longer.I would start checking around the 2:30 mark and go from there. Slow cookers can vary in how fast they heat up and the temperature they cook at, so the cooking time can vary quite a bit. I haven’t tried it in a regular oven, but I suspect that you could bake it just like a pumpkin pie without any issues. Let me know how it goes! I put it in an 8××8 baking dish at 350 for 45 mins. Turned out fine. I see that you think maple syrup and sweet potatoes would work. Which sounds wonderful. I love both sweet potatoes and pumpkin anything! So I’m thinking that if I make this with pumpkin I could also use maple syrup instead of the stevia blend. I don’t use any sugars that end in ol. I have IBS-C and it makes my symptom’s worse. Yes, I think all of those substitutes would work. The nutritional values will change substantially, so you may want to keep that in mind if you’re looking to stay within a certain macro range. The only sugar alcohol I can deal with is erythritol. The others make me miserable. I think maple syrup will be a delicious substitute. If you make it this way, I’d love to know how it turns out! This is baking in the oven now as it is near dinner time and want it done sooner. I eat mostly paleo but moderate carbs…used coconut sugar which is lower glycemic…Wish now I had started with 1/4 cup and moved up to 1/2 but put in 1/2 cup and it is really too sweet. Otherwise vey yummy. I will likely let hubby eat most of it as he likes dessert and won’t mind. I will still make again with way less coconut sugar and a bit of stevia. Thanks! Thanks for your feedback, Jill! It’s nice to know how substitutions work. Jill, how long did you bake it and what temperature? Thanks! This was amazing. First time I’ve ever made anything with pumpkin and really liked it! Thanks so much for your feedback! Glad your first time was a success! Could this recipe be baked in the oven instead of using a crock pot? Thanks ! I haven’t done this yet, but I don’t see why that wouldn’t work. It would be just like a crustless pumpkin pie! Am allergic to tree nuts. Can I substitute all purpose flour in this recipe? All purpose flour should work fine in this recipe, but will change the nutritional information. You may even be able to leave it out–the custard will probably just be a bit more dense. I haven’t tried either of these changes. Could I use 100% pure Xylitol granules as the sweetener? How much should I use? Xylitol should work fine. Xylitol has the same sweetness level as sugar, and the sweetener I use is twice as sweet as sugar. This means that you will need to double the amount of sweetener if you use xylitol. Yes, but you will need a lot less as it absorbs so much more water. I’m not sure of the amount because I haven’t tried it this way. I would try about a tablespoon. Hi Annissa! I visited via a Pinterest pin and am so happy to have found you! I’ve been eating eating Keto/LC for almost four years so new recipes are always fun! Just wondering, what is the function of the almond flour? I thought maybe I’d misread the part about it being crustless… so I’m not sure what it does for the custard? BTW…those sticky buns on this same list…look out! Yum! I’m so glad you found our site, too! The almond flour adds a bit of thickness and bulk. It is not used to form a crust. In fact, it could probably be left out, but I haven’t tried it that way. Do you know the cooking time when doubled in a six to eight quart crock pot? Mines been cooking for over three hours and is still very soft in the middle. The first two hours I had it set to low but I turned it up to high for the last hour. The sides are getting cooked but the middle is still very soft. Almost completely uncooked. Oh no! I would have thought it would be done by now. I would have thought the time would be similar or maybe a bit longer because while there is more liquid, there is also more heated surface touching the custard. The shape of the pot can make a difference too. A taller, more narrow pot would take more time, while an oval one would take less time because the custard can spread out. Another thing that can present an issue with a slow cooker is opening the lid and checking it. This lets out much of the heat and it needs to heat back up to the baking temperature. I have a can of pumpkin in my cabinet, so I may try to double it and use my 6 quart cooker and see how it goes. I made the recommendation because I know most people only have one slow cooker and I wanted to make the recipe accessible to everyone. I was afraid a single batch would not cook well spread out so much. I also had made similar recipes in my 6 quart, so I felt fairly confident that it would work. I guess I may have been wrong. I do hope it wasn’t a complete failure. You’re welcome! Thanks for your awesome feedback! This was crazy easy and so delicious…..big hit …..you have a fan any one of your recipes have come out great . I MAKE THIS PUMPKIN CUSTARD FOR MY BOSS SHE JUST USES REGULAR SUGAR AND NO FLOUR BAKES IT IN THE OVEN@350 DEG. SHE LIKES TO SET THE CUSTARD IN A LARGER DISH OF HOT WATER AND BAKES IT FOR ABOUT 45 MIN.TO ONE HR. IT IS DONE WHEN A KNIFE INCERTED IN THE MIDDLE COMES OUT CLEAN. PS:ONLY A HALF OF A LARGE CAN OF PUMPKIN IS USED BUT AS MY HUSBAND AND I ARE ON THE KETO DIET I AM GOING TO MAKE YOUR RECIPE THANK YOU . The recipe takes one cup (not one can). This is about 8 ounces. You could use that. You may need to increase the amount, however as I believe it is the same sweetness as sugar. The sweetener I use is twice as sweet as sugar. 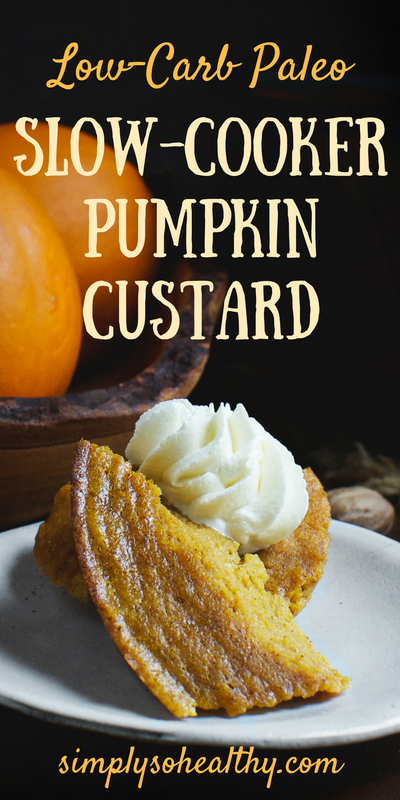 This pumpkin custard looks to die for!! I love that you can make it in a slow cooker, and that it is low carb! Sounds like ths needs to be my go-to dessert for Fall! It’s on my to-make list this week. Now that Labor day is over, I find myself suddenly craving pumpkin. How large is the serving size? I truly wish recipes would state this as it makes it so much easier to stick to a plan. I am definitely going to make this over the weekend. Thanks for checking out our site. The recipe states that there are six servings. What I would do, if I wanted to stir to a plan is to cut the custard into 6 equal portions before scooping it out. That way, you have clear portions before you ever start eating it. I hope you enjoy it! It took about 2hours and 25mins. Thanks for the recipe . This looks like a fantastic dessert! I’m playgo make it Tomorrow morning but I am celiac and on a low fodmap diet for IBS. I can’t use almond or coconut flours. Would sorghum flour or quinoa flour work and any suggestions for quantity? Thanks so much. I think you may be able to get away with leaving it out. I think I remember someone commenting that she had done that successfully. I think it’s a matter of personal preference. I tend to warm mine, but if you like cold pumpkin pie, you will probably like it cold as well. Yummy!! Used coconut flour, 1 tablespoon worked just fine. Erithritol, so I powdered and doubled. I also doubled the pumpkin pie spice because I like it zesty!! But that does increase carbs.. A really nice recipe and so easy to throw together. Thanks for sharing your substitutions! It’s always helpful for other to see what worked! Do you think this can be made in a rice cooker? My crock pot is big. But, the rice cooker is much smaller. I’m not really sure. Can you alter the temperature of a rice cooker to be similar to a slow-cooker? In previous comments, some people have mentioned they have been successful baking it in the oven. Excellent! I subbed a scant 1/2 cup coconut sugar and it seemed plenty sweet to me, but I have not had much sugar in the last year, so someone else might prefer a tad more. I will add just a tiny pinch of salt instead of 1/8 tsp next time. I baked it in a Pyrex loaf pan 350 for 45 mins and it was perfect. I also used only 1/4 cup almond flour because that was all I had. 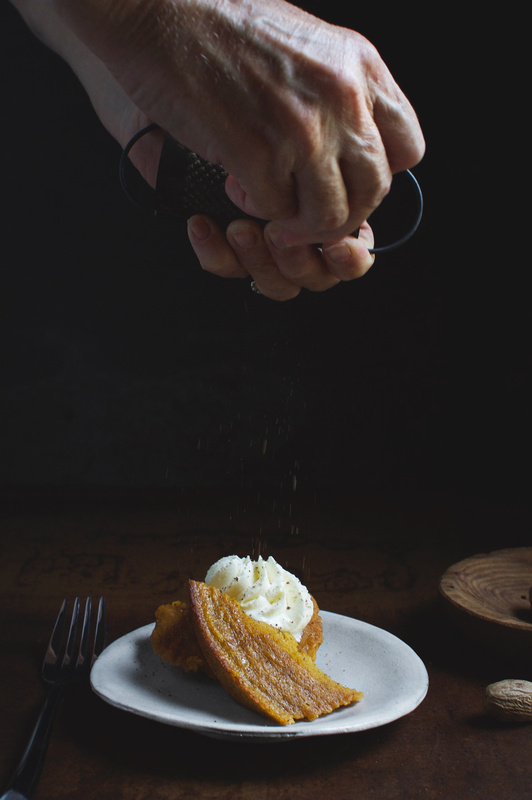 Topped with whipped cream, hot from the oven – this is truly a wonderful Fall dessert. My last bite I drizzled a teeny bit of maple syrup over it, and WOW… That bite was epic! Thanks for sharing your substitutions! I have had a lot of people asking about baking this in an oven so I know people will find that information helpful. I love this dessert served hot! I did spilt into 6 servings and my ingredients were just store brand. Next time I’ll try organic ingredients & hopefully the carbs & calories will be lower. Swerve is only half as sweet as Pyure, so you would need to use twice as much as the recipe states to create the same level of sweetness.While I provide food calculations to help everyone out, I do suggest that people calculate the nutritional values using their own ingredients as it can make a difference. Sounds delicious! I’m excited to give this a try for our office potluck. Can I make this the night before, leave it in the crock pot (store in the fridge), and reheat in the crock pot they next day? Would I reheat on low? And for how long would you recommended? I have reheated leftovers in the crockpot the next day. I believe I used a low setting, but I honestly didn’t keep track of how long I heated it for. I just heated it until it was warm. My husband can’t have stevia, can I just use erythritol, if so how much? You would need to use at least twice as much erythritol. Pyure is twice as sweet as sugar and pure erythritol is not as sweet as sugar. My only hesitation on using this substitution is that when using that much erythritol, you may have some trouble with it going into solution. I only have Splenda and Truvia packets for a sweetener. How many should I use for this recipe? Which one is better? For the same sweetness, you would need to use 24 packets of Truvia. Excellent recipe- even the kids liked it!